15-Oct-2017 -- This is the last out of 4 reports reaching confluence points during a 4-day cycling trip from Madrid to Barcelona. The story continues from 41°N 1°W and starts from 41°N 3°W. After I had spent the night in the town Andorra (Teruel), I continued cycling eastwards the next early morning. I came through the towns Calanda, Castelserás, and finally I reached the village Valdealgorfa (3 km beeline to the CP). From there, a tiny but asphalted road leads to the confluence point (minimal distance 430 m). On gravel tracks I was able to cycle up to a distance of 20 m to the confluence point. There was still morning fog when I visited the confluence so I cannot offer pictures with a good view here. 10 minutes after the visit the fog suddenly disappeared, but I was too lazy to return for nicer pictures. Anyway, a confluence visit should give an unbiased view of the area – it is as it is! There are bundles of grass and dwarf oaks growing at the confluence point. Previous visitors have set up a cairn. 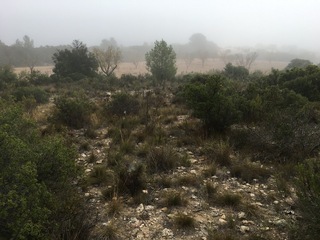 After the visit I soon reached the fantastic Terra Alta Greenway which starts just 600 m south of the confluence and follows the former railway line all the way to the coast. It is now a bicycle highway with viaducts, tunnels and former railway stations. In the evening I reached the coastal town Cambrils and spent the night there. The next day I rode to Barcelona to catch my flight back to Zurich.